It is a heterogeneous disorder, produced by mutations in multiple genes coding for sarcomeric proteins (e.g. 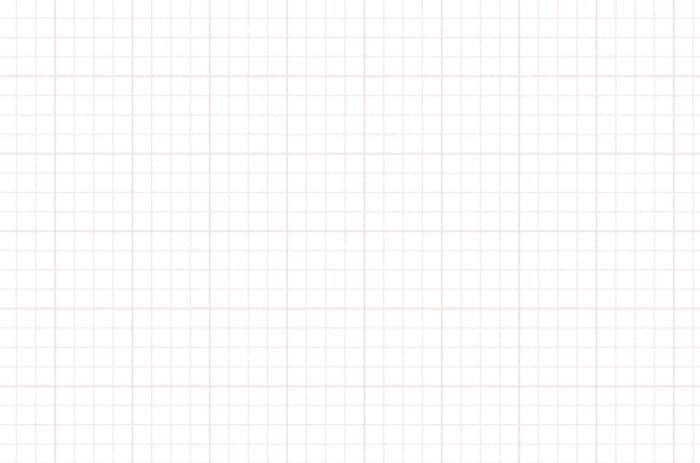 beta-myosin heavy chain, troponin T). Inheritance is primarily autosomal dominant, with variable penetrance. Over 150 mutations have been identified, which explains the variability in the clinical phenotype. The chief abnormality associated with HCM is left ventricular hypertrophy (LVH), occurring in the absence of any inciting stimulus such as hypertension or aortic stenosis. The degree and distribution of LVH is variable: mild hypertrophy (13-15 mm) or extreme myocardial thickening (30-60 mm) may be seen. The most commonly observed pattern is asymmetrical thickening of the anterior interventricular septum (= asymmetrical septal hypertrophy). This pattern is classically associated with systolic anterior motion (SAM) of the mitral valve and dynamic left ventricular outflow tract (LVOT) obstruction. However, in the majority of cases (75%), HCM is not associated with LVOT obstruction (hence the name change from HOCM to HCM). Other less common patterns of LVH include concentric hypertrophy (20% of cases) and apical hypertrophy (10%). Dynamic obstruction of the LVOT. Left ventricular diastolic dysfunction resulting from impaired relaxation and filling of the stiff and hypertrophied left ventricle (often associated with increased filling pressures). Abnormal intramural coronary arteries with thickened walls and narrowed lumens. Chaotic, disorganised left ventricular architecture (“cellular disarray”) predisposing to abnormal transmission of electrical impulses and thus serving as a substrate for arrhythmogenesis. Exertional syncope or pre-syncope — this is the most worrying symptom, suggesting dynamic LVOT obstruction ± ventricular dysrhythmia, with the potential for sudden cardiac death. Symptoms of pulmonary congestion (e.g. exertional dyspnoea, fatigue, orthopnoea, paroxysmal nocturnal dyspnoea) due to left ventricular dysfunction. Chest pain — may be typical anginal pain due to increased demand (thicker myocardial walls) and reduced supply (aberrant coronary arteries). Left ventricular hypertrophy results in increased precordial voltages and non-specific ST segment and T-wave abnormalities. Asymmetrical septal hypertrophy produces deep, narrow (“dagger-like”) Q waves in the lateral (V5-6, I, aVL) and inferior (II, III, aVF) leads. These may mimic prior myocardial infarction, although the Q-wave morphology is different: infarction Q waves are typically > 40 ms duration while septal Q waves in HCM are < 40 ms. Lateral Q waves are more common than inferior Q waves in HCM. 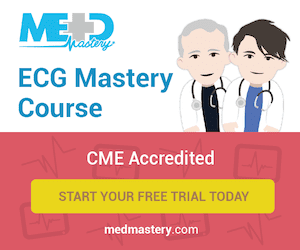 Left ventricular diastolic dysfunction may lead to compensatory left atrial hypertrophy, with signs of left atrial enlargement (“P mitrale“) on the ECG. There is an association between HCM and Wolff-Parkinson-White (WPW) syndrome: ECG features of WPW were seen in 33% of patients with HCM in one study. At least one genetic mutation has been identified that is associated with both conditions. Atrial fibrillation and supraventricular tachycardias are common. Ventricular dysrhythmias (e.g. VT) also occur and may be a cause of sudden death. This relatively uncommon form of HCM is seen most frequently in Japanese patients (13-25% of all HCM cases in Japan). There is localised hypertrophy of LV apex, causing a “spade-shaped” configuration of the LV cavity on ventriculography. 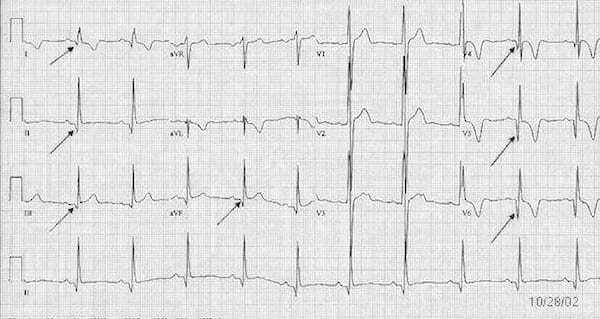 The classic ECG finding in apical HCM is giant T-wave inversion in the precordial leads. Signs of WPW (short PR, delta wave). There is a small subset of patients with HCM who will have an abnormal ECG with no evidence of LVH on echo. If these patients present with symptoms (e.g. chest pain, exertional syncope) and have a characteristic HCM ECG (showing LVH and dagger-like Q waves), they need to be referred for a cardiac MRI. Voltage criteria for left ventricular hypertrophy. Deep narrow Q waves < 40 ms wide in the lateral leads I, aVL and V5-6. This ECG was taken from a 30-year old man who presented with exertional lightheadedness and palpitations. 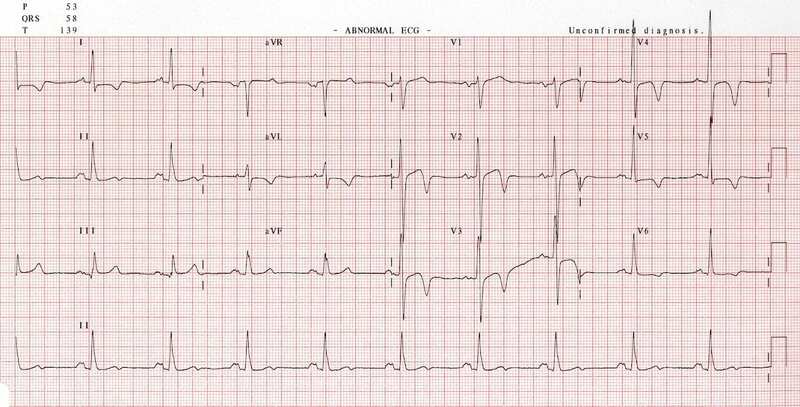 The ECG was misread by the cardiology team as showing “left ventricular hypertrophy, lateral infarct age undetermined”. The patient was discharged home and subsequently died of a VF arrest while running to catch a bus. Autopsy showed septal hypertrophy consistent with HCM. 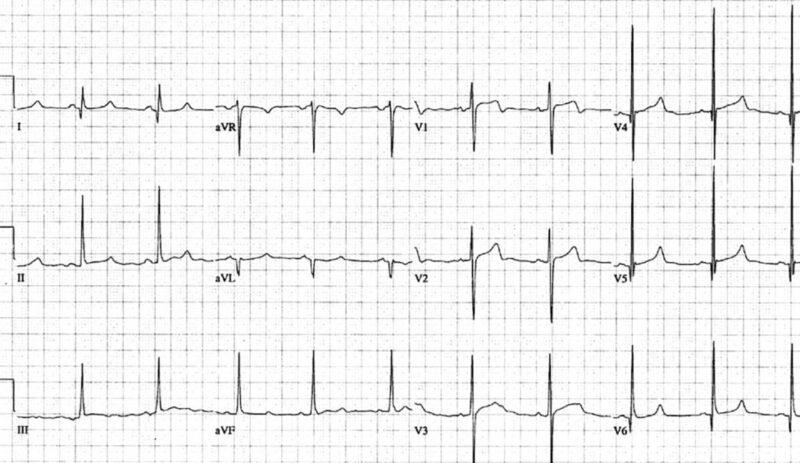 Teaching Point: In a young patient presenting with exertional symptoms and an ECG that looks this this, think HCM — not “prior lateral infarction“! This ECG and clinical vignette is reproduced from a fantastic review article by Kelly, Mattu and Brady (2007). Deep, narrow, septal Q waves most prominent in leads I and aVL; also seen in V5-6. This great ECG is reproduced from Kelly, Mattu and Brady (2007). Inverted T waves are also seen in the inferior and lateral leads. This great ECG is reproduced from Hansen & Merchant (2007). Deep T wave inversions in the precordial and high-lateral leads. There is also evidence of left atrial enlargement (“P mitrale”).